In-Page Analytics is a Google Chrome extension that lets you see some parts of your Google Analytics data right there on your website, no need to go to Google Analytics. 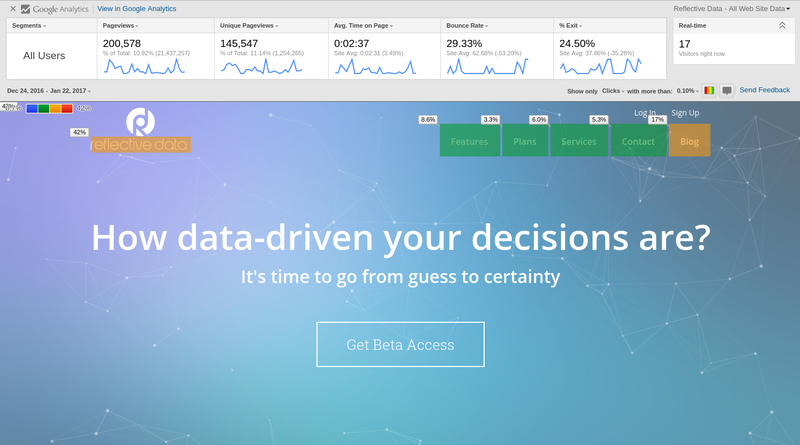 Here’s an example of In-Page Analytics in action on our homepage. Again, In-Page Analytics is not here to replace actual Google Analytics reports but rather to get some quick insights on how are people using your website. We find In-Page Analytics super useful for those who don’t have enough time to build custom reports in Google Analytics and just need some simple overview of how a specific page is being used. To learn more about In-Page Analytics, take a look at this article. Install the In-Page Analytics extension from Chrome Web Store.